With a swollen ankle, after my attempted sprint down from Mount Toubkal, I was trudging through the old bazaar sipping some fresh orange juice when I saw an arched opening in between two fruit-seller carts. Needing a rest, I figured it might be a masjid and a good place to regain some strength before continuing the walk back to the hostel. Time was also running out for the zuhr (noon) prayer. 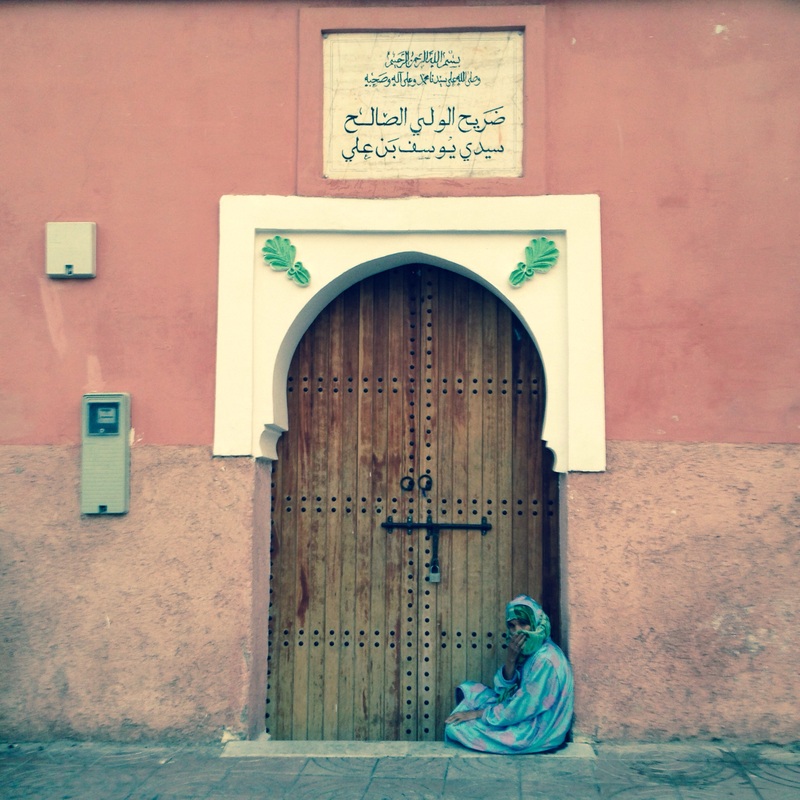 A woman at the door of the shrine of Sidi Yousaf Ben Ali. I was told the shrine has been closed to public for some time. As I took my shoes off to enter, one of the fruit sellers waved at me saying ‘no tourists!’. I told him I was going inside to pray at which he retorted that it wasn’t a mosque but a Zawiya and I shouldn’t pray there. 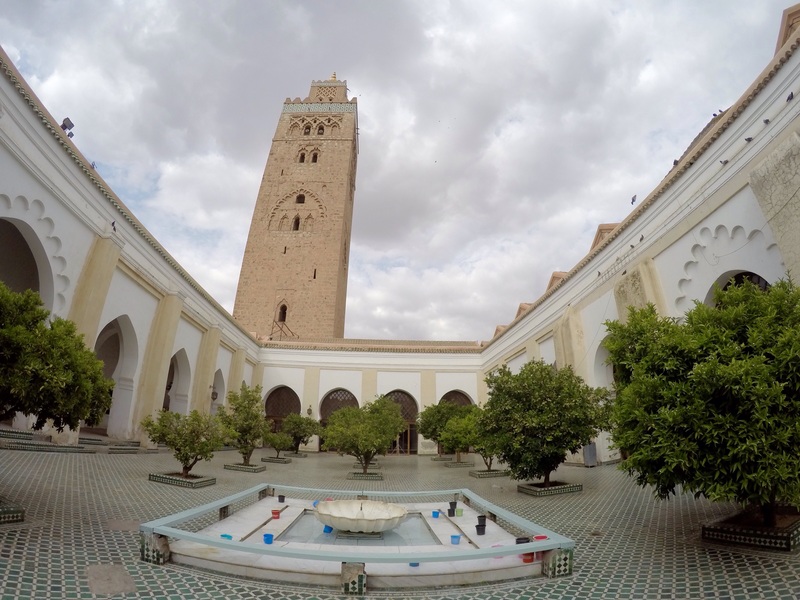 Over the course of the few days I’d been in Morocco I had been warned at numerous occasions of Zawiya’s and the people who pray there. Their response was always along the same lines whenever I inquired why, ‘people commit shirk (ascribing partners with God) there as they make dua’a (supplicate) to the dead’. One of the interesting things that Ben Asad’s father mentioned while we were seated there was that a man never visit these places by his own volition, “One is always invited”, he said. All of a sudden I remembered that Moncef, whom I met in Tangier, and I had felt the same way a few days earlier. On one of our strolls in Tangier we reached the dead end of a narrow street in the old city and were standing there admiring the massive doorway, when it suddenly opened and an old man peered through it and ushered us in. A little surprised and curious we both followed him inside only to find that it was a masjid and it was time for maghrib prayer. Later on we realized that it was in fact a Zawiya as well. We had both remarked, when we came out, that it felt as if someone had asked that old man to invite us inside. A few weeks after leaving Marrakesh I would meet Sean, an Irish man, in Cairo who was disillusioned by all the religions. He would return to the hostel the following day with a copy of the Quran after a visit to a mosque. 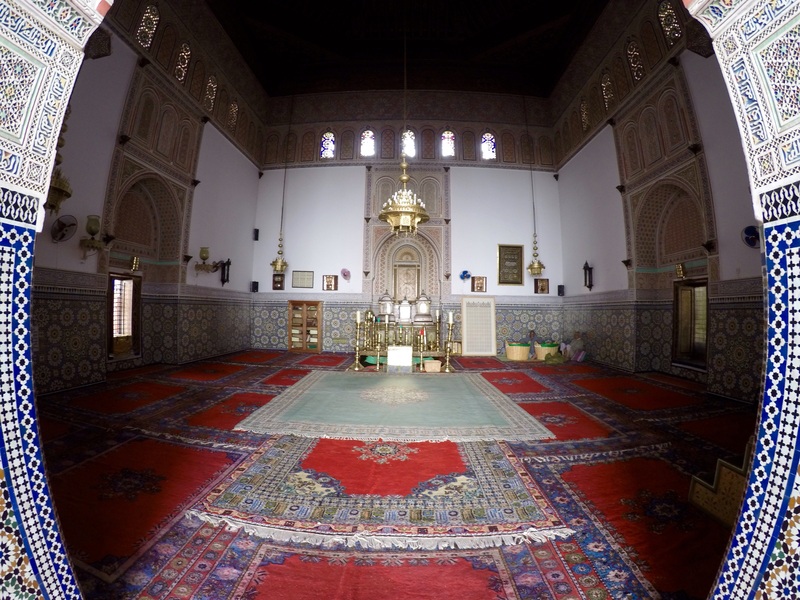 Upon my inquiry as to how this sudden change of heart transpired, he would reply to my astonishment “I felt like I was invited there”, having never intended to visit the mosque..
Bin Ali visits Marrakesh every year with his American father for a few months. And it was on one of their usual visit at the Zawiya of Sidi Nadhifi where I met them. He and his father are among the few westerners who come to Marrakesh not for its bazaars, or its proximity to the Sahara and the Atlas Mountains but for the spiritual heritage of this city and to benefit from all that other worldliness that exudes due to the presence of over two hundred saints (awliya – plural of wali) who are buried here. 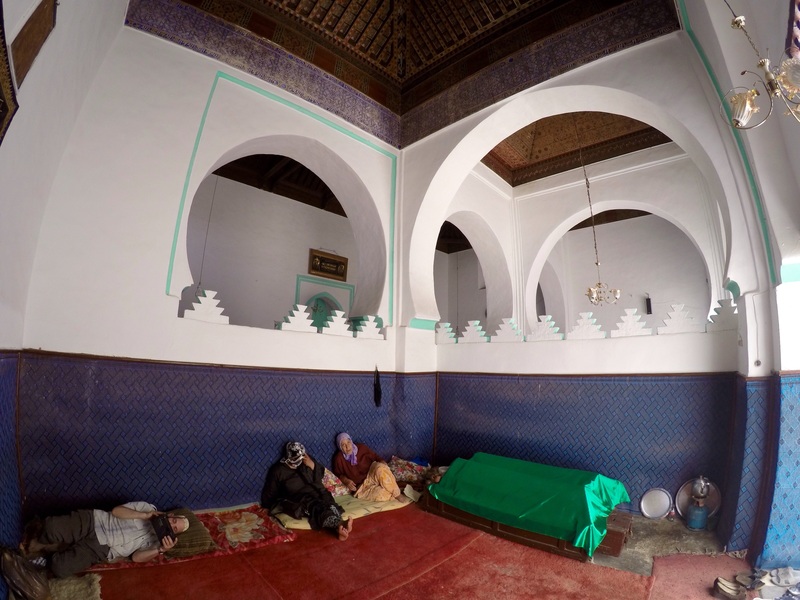 Some people refer to Marrakesh as the city of Sabatou Rijal (the seven men), who were the guiding lights during their times. I was only able to visit the shrines of four of the saints, however those interested in visiting or finding more about them may find this post on Sacred Footsteps helpful.